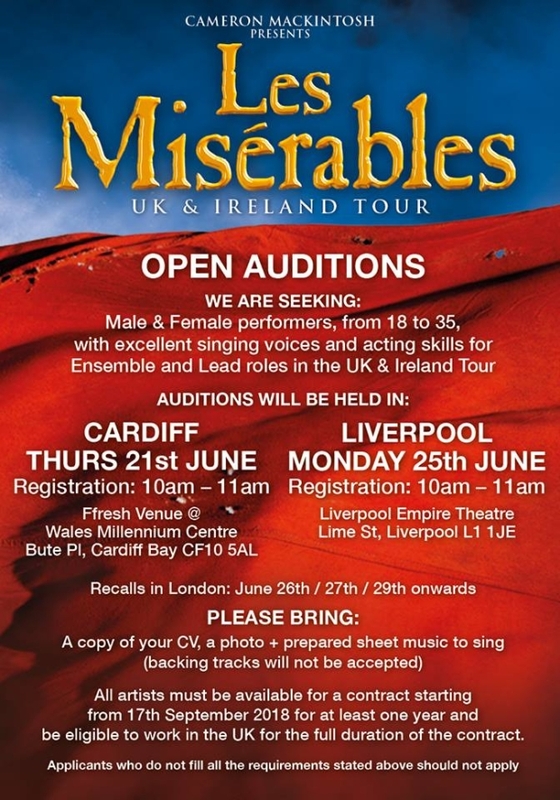 Les Miserables have announced open auditions for UK and Ireland tour which stars Killian Donnelly as Jean Valjean and kicks off in November at Leicester Curve and currently runs until October 2019. The production is looki ng for male and female performers, from 18 to 35, with excellent singing voices and acting skills for ensemble and lead roles. 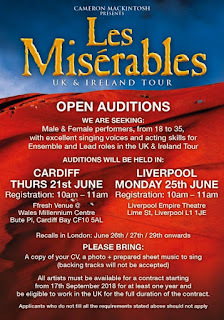 Auditions will be held at Wales Millennium Centre in Cardiff from 10:00am to 11:00am on 21st June and Liverpool Empire Theatre from 10:00am to 1:001am on 25th June, with recalls being held in London on 26th, 27th and 29th June. Auditionees need to take a copy of their CV and prepared sheet music to sing, and must be eligible to work in the UK and available for a contract starting from 17 September 2018 for at least a year.